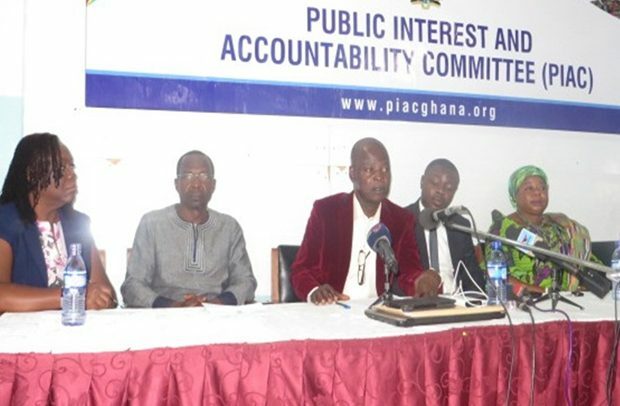 The Public Interest and Accountability Committee (PIAC) is unhappy with what it describes as wrongful payment of millions of dollars meant for the Petroleum Holding Fund (PHF) into accounts of the Ghana Revenue Authority (GRA). According to PIAC, over US$43 million was wrongfully paid into GRA account instead of PHF in 2017. PIAC raised the concern in its 2017 annual report. “PIAC finds the recurrence of wrongful lodgment of petroleum funds into GRA accounts unacceptable. GRA must immediately transfer the accumulated funds into the PHF. The Ministry of Finance must provide guidelines to forestall similar occurrences,” the report added. PIAC also accused the GRA and the Ghana National Petroleum Corporation (GNPC) of ‘hijacking’ monies from Ghana’s oil sector. According to PIAC, instead of releasing the monies wrongfully paid into its accounts as stated by law, the institutions kept them in their accounts. PIAC’s 2017 annual report also showed that governments have failed to implement several critical recommendations from previous reports. Since it was set up in 2011, PIAC has been monitoring and evaluating the management of Ghana’s petroleum revenues by the government and institutions of the State. The latest report from PIAC indicates several recommendations have not been implemented. PIAC, in its 2017 report, also complained that after six years of the coming into force of the Petroleum Revenue Management (PRMA) Act, 2011 (Act 815), the regulations that will help with the implementation of the law are yet to be passed, leaving the utilization of Ghana’s oil revenue in jeopardy. PIAC recommended that the regulation should be drafted immediately for the approval of Parliament. PIAC believes further delay in the passage of the regulations could hamper the implementation of the PRMA. Under the surface rental non-payment and arrears, PIAC disclosed that Oranto/Stone Energy has still not honoured an outstanding surface rental invoice of $67,438.36 since February 2013 despite several calls. PIAC, in its report, revealed that GRA had said it could not locate Oranto/Stone Energy located in Angola and Mozambique. GRA, according to PIAC, can collaborate with the relevant authorities in these jurisdictions to retrieve the money. On Energy sector legacy debt and nonpayment of receipts from the sale of lean gas to Ghana National Gas Company (GNGC) and Volta River Authority (VRA) respectively, GNGC may well have been caught up in the vicious cycle of indebtedness of the energy sector utilities of the energy sector utilities which stood at $2.4 billion at the end of 2016. “In 2017 alone, VRA received lean gas worth US$279,910,118.08 from GNGC, but has not paid up, incurring US$16,737,531.29 in interest to GNGC,” the report added. PIAC also called for transparency in the management and disbursement of the Energy Sector Levy Act (ESLA) Fund. For instance, the Ministry of Finance should disclose how much of the seven and ten-year bonds have been utilized to clear the debts so far.